Canada Day, Blogger Meet Up and Running! I have to admit, it’s been a great few days into my little vacation week! 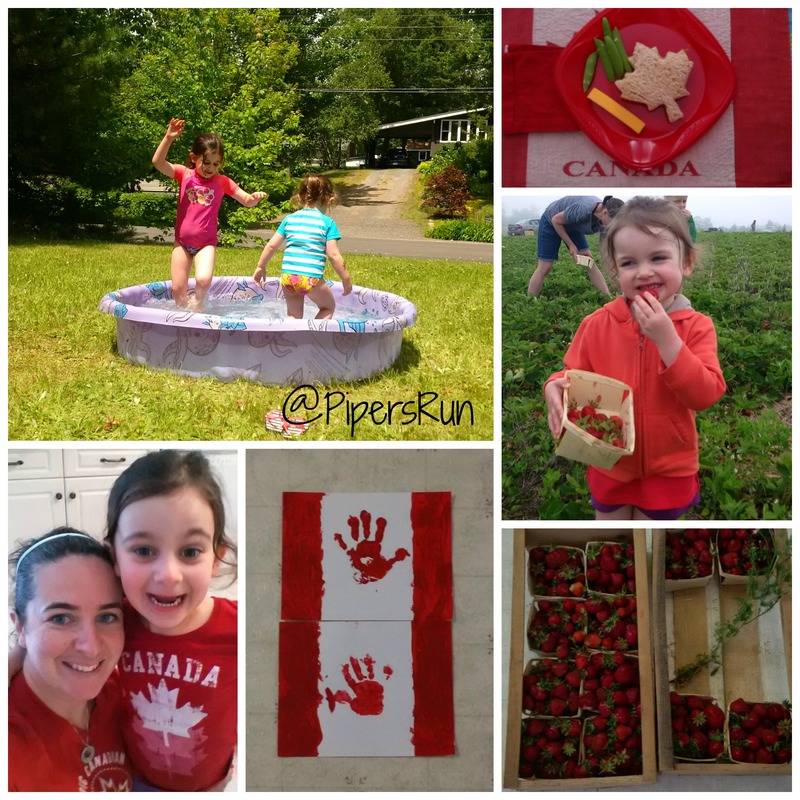 Wednesday was Canada Day so we decided to celebrate doing a few different things! It started off with strawberry picking (16 boxes – 4 missing from the photo that we dropped off at our neighbour’s house). I’m pretty sure Hilary walked around with the same number of red/white strawberries in her box the whole hour we were there. And I’m pretty sure she ate more juice red strawberries then could fit in one box alone! We played in our little kiddie pool, had a maple leaf shaped sandwich and then went to a friends house for a BBQ! It was a blast but an exhausting day for me! 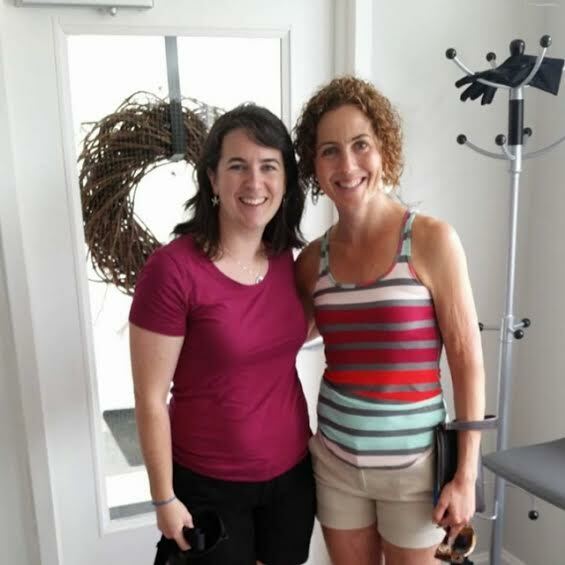 After my run, I quickly showered and went out to meet up with Kyla from Early Bird Fitness! She’s originally from the Valley area in Nova Scotia – where I live. However, she currently lives in British Colombia – the opposite side of Canada! We’ve become online blogger friends and got the chance to meet up while she was home on vacation. It’s funny when you meet someone, you just know you’d click and could talk for hours! That’s how I felt. She’s super sweet, funny and a great person to learn lots from – especially when it comes to running. She even invited my family to come stay with her some time and she hasn’t even met them in person!!!!! Super sweet! We snapped a quick photo before we had to part ways – I was getting a hair cut (as you can see my crazy hair) and she was heading back to spend time with her Nan. I ran a few more errands (didn’t find the plunger Kyla but I’m still looking) and got home in time to prep dinner to go along with the ham in the slow cooker! 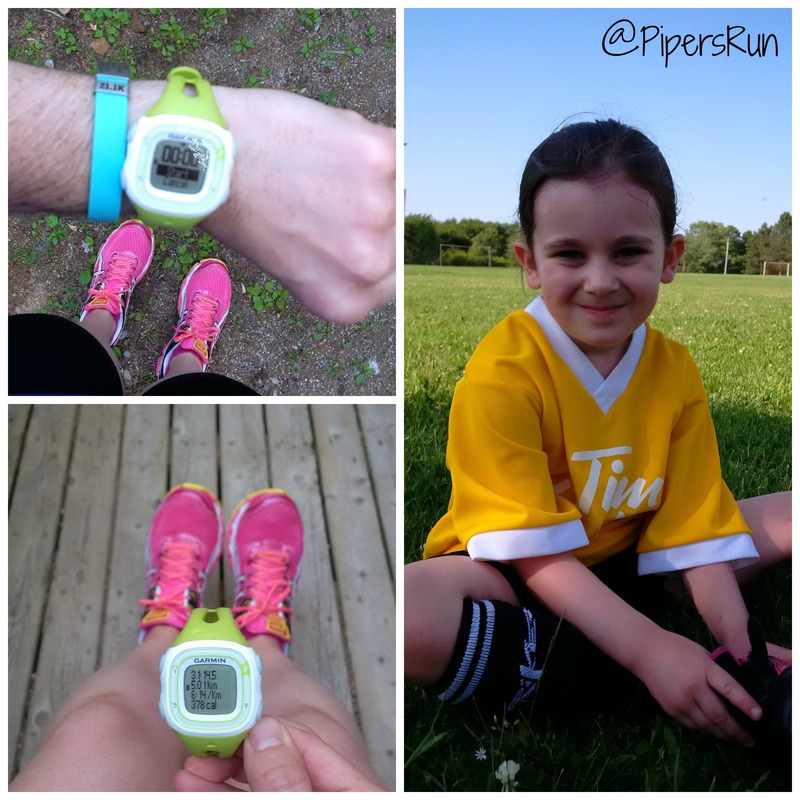 Once I got the girls, it was go time as Lilly has soccer on Thursday nights! My run this morning wasn’t great but it was bad either. I woke up in a rather weird mood and wasn’t digging anything. Since the girls were in day care I wanted to take advantage of being kid free and run in the day. At 8:30 am I headed out and ran around my subdivision. I wasn’t loving it and many, many times I thought about walking but for some reason I kept running. By the time I got back home I was drenched in sweat, in a much better mood and 5k training run done. I’m trying not to think about the 5k I didn’t run the day before! How was your Canada Day? What’s your best post run tip for running in the heat? Me – sitting in my cool basement. So fun that you got to meet another blogger friend! Sounds like you had a great day. Post run, I like to grab coffee (yep, hot coffee, even after a run!) and sit in the air conditioning or jump in my pool!! Love your solution to the heat 😀 and love the kiddo in her soccer kit! But you know what I am obsessed with? The Maple Leaf sandwiches! I want a maple leaf cutter and I’m not even Canadian! You know I love meet blogger friends, and I’m lucky to have so many around me–many have become some of my closest buds. Have a great weekend! The maple leaf sandwich was a last minute decision and they LOVED it…it was hilarious! Might have to do that more often for them! Meeting blogger friends in real life is awesome and you’ve met so many ! Happy 4th of July to you, hope you and Alex are able to enjoy the weekend together. Oooh I miss strawberry picking. Alberta’s climate does not make for fruit growing 😦 I would find the closest water body and jump in! Or if that fails …. running under a garden hose! So fun! I love meeting bloggers. 🙂 The local strawberries are awesome this year!!! I know they are every year, but I can’t stop eating them this year, lol. Oh the strawberries are amazing! Going to pick some more soon!